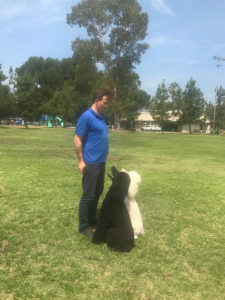 It is common for the beginning dog trainers in Los Angeles to make the same mistake: they do not train their dog and rely on the fact that with the age, it will “grow wiser” and will stop making pranks. In fact, he will remain a bad-mannered dog, only old – aged. Therefore, the training of the dogs should be thought in advance, even before the acquisition of the future pet. In the puppyhood, the dog is simpler and easier perceives the training, and it is easier for the dogs to be taught to behave correctly. With the training of dogs in Los Angeles is engaged a fairly large number of the institutions and individuals, but not many of them provide the really high-quality services. In order not to be fooled, it is necessary to apply exclusively to the proven centers where the professional dog trainers actually work. One of such institutions is the Master Dog Training School. The nuances of the work and the training costs are settled at once. We provide the dog training services in Los Angeles at a reasonable, democratic price, that are available virtually to all the segments of the population. You can always contact us for advice and find out the feasibility of the specific exercises. We are having the opinion that the owner should know what is done with his dog. You can order the dog training services in the Master Dog Training School, in one of the three centers in Los Angeles.